You're from Tennessee and a you're a Christian! Hey, it don't get any better. Congrats, my Brother!!!!! Congratulations Rich! You are The Fittest Christian on Earth - Physically & Spiritually. God Bless!!! Congratulations on your win. God Bless from CrossFit Gisborne in New Zealand. You are an inspiration to us all. It is so awesome to see the name of our Lord lifted up on high. From one Christian brother to another: I really appreciate how you have praised God in your interviews throughout the Crossfit coverage. Your boldness for God is just as impressive as your fitness level. Keep it up! 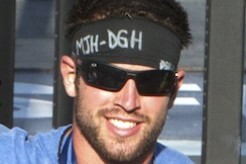 Congratulations Rich Froning! Praise the LORD for He is worthy of all praise! You did it brother! "Blessed is the man who walks not in the counsel of the ungodly, nor stands in the path of sinners, nor sits in the seat of the scornful; but his delight is in the law of the Lord, and in His law he meditates day and night. He shall be like a tree planted by the rivers of water, that brings forth its fruit in its season, whose leaf also shall not wither; and whatever he does shall prosper. Congrats from Croatia! YOU ARE THE FITTEST ON EARTH ! Just added up the scores brother! All you have to do is complete each of the final three events, and even if you finished last on each of the final three events, you will still be in first place over-all! You are the 2011 CrossFit Games champion! Praise the LORD!